You know, there are those that feel compensating is a indication of an embarrassing inadequacy. 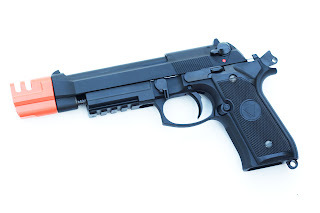 However, in the case of the Airsoft GBB Pistol in this review, that's just not true. 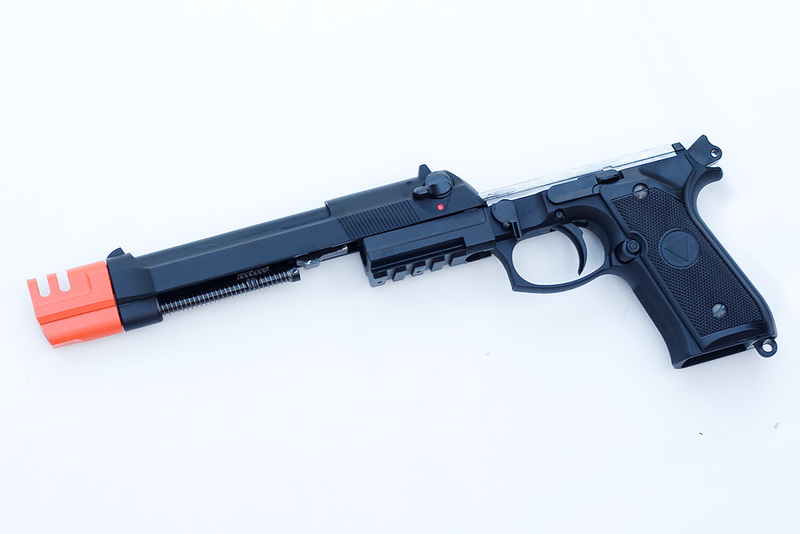 This gun compensates simply for the sake of looking good. The gun is not inadequate and has no reason to feel insecure. In case you weren't sure what the falcon is going on here, let me clear the air. Click on any of the images in the review for a larger, more detailed view. Trust me, this gun looks good up close, too. 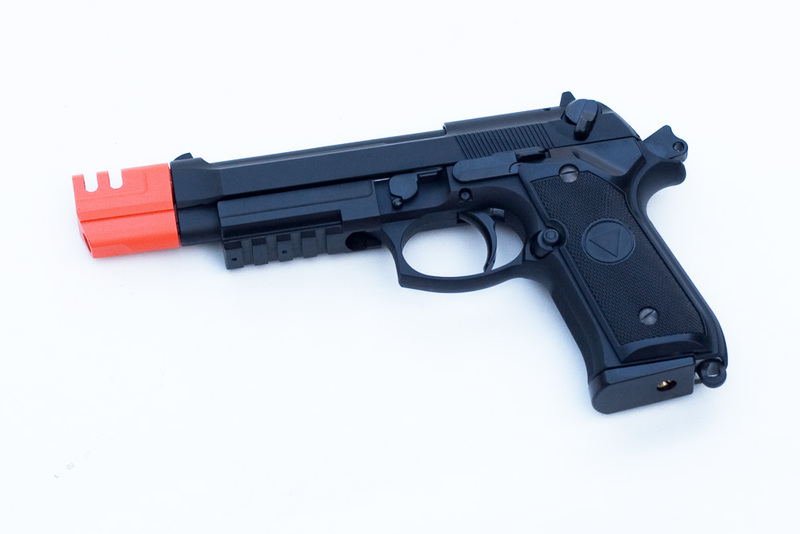 This gun is mostly made of ABS plastic. This makes it very lightweight, which is going to be ideal for situations where you're carrying a lot of extra stuff that you may or may not need to look "tactical hot." The lightweight plastic slide also gives the gun a quick, crisp blowback cycle. 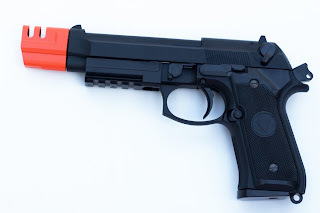 I believe the compensator is also made of some type of plastic as well, but it's hard to tell. My reason for guessing it's plastic is the light weight feel. It doesn't add any real noticeable weight to the front end of the M9X. You can see in the two images above most of what we're working with here. 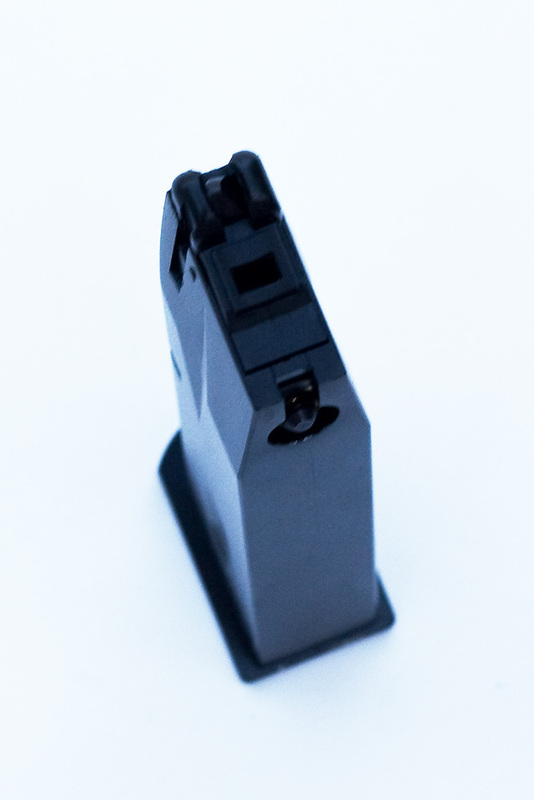 An item to note would the rail system for mounting your favorite, or at least functional, tac light/laser units. You can also see that the M9X Tac has ambidextrous safeties. This picture is mildly redundant. Just a very slightly different angle than the one to the top right of this pointless sentence. 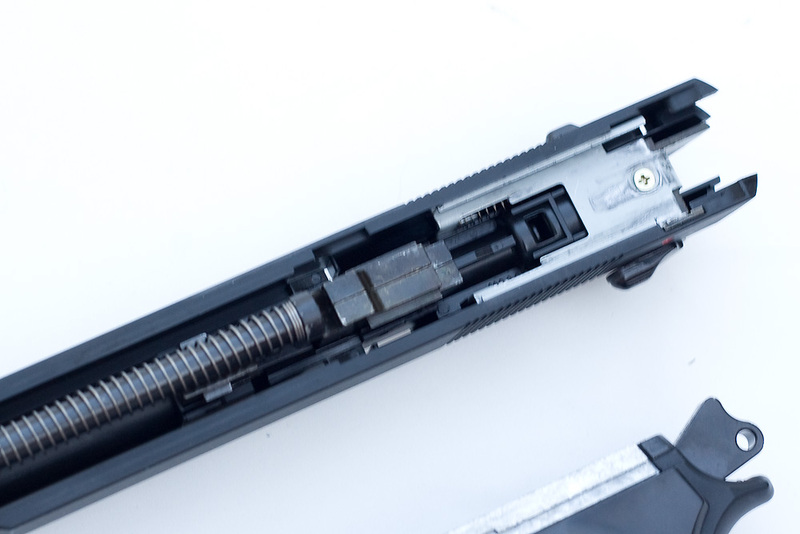 In the image above, one might notice the small ring protruding from the base of of the hammer spring housing, directly behind the magazine base. For you noobs out there, this is for attaching a pistol lanyard, which is a very handy retention tool. 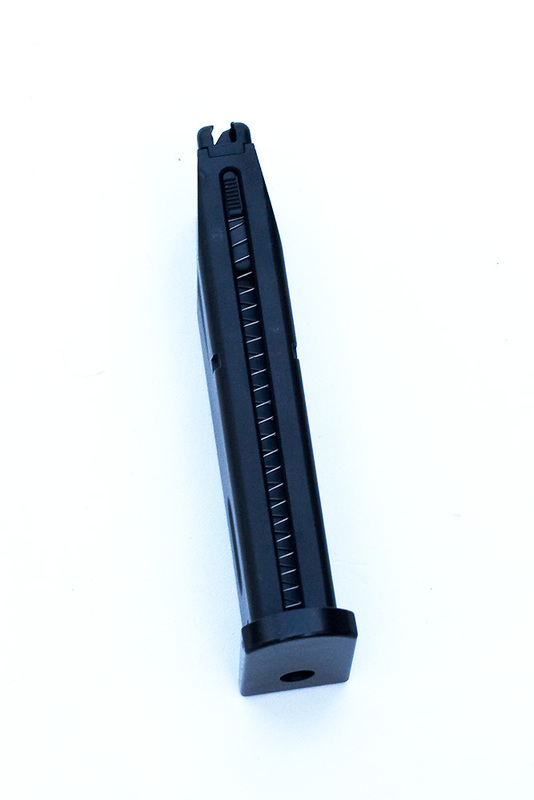 You attach one end of the lanyard to your person, and the other clips on to that loop you see on the gun. This helps prevent the loss of your pistol in the event you are using a terrible holster during a game. 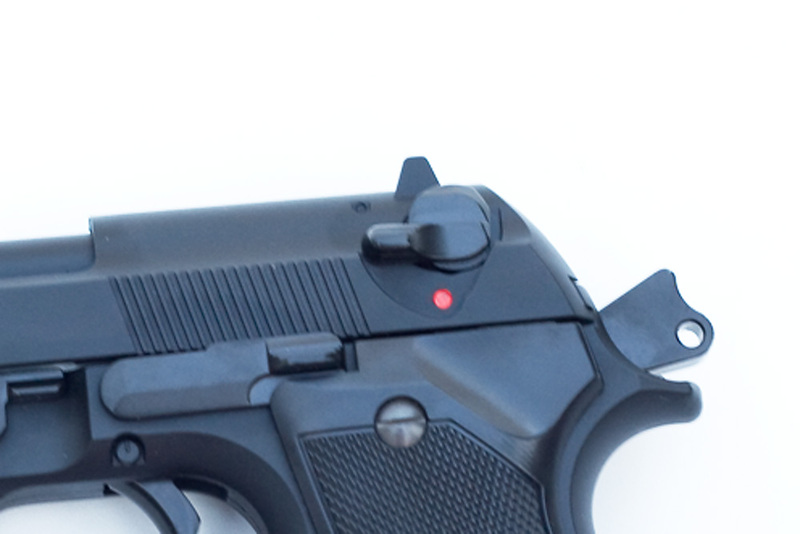 View of the chamber, with the mag inserted. Nothing too exciting. I ALWAYS recommend extra magazines. 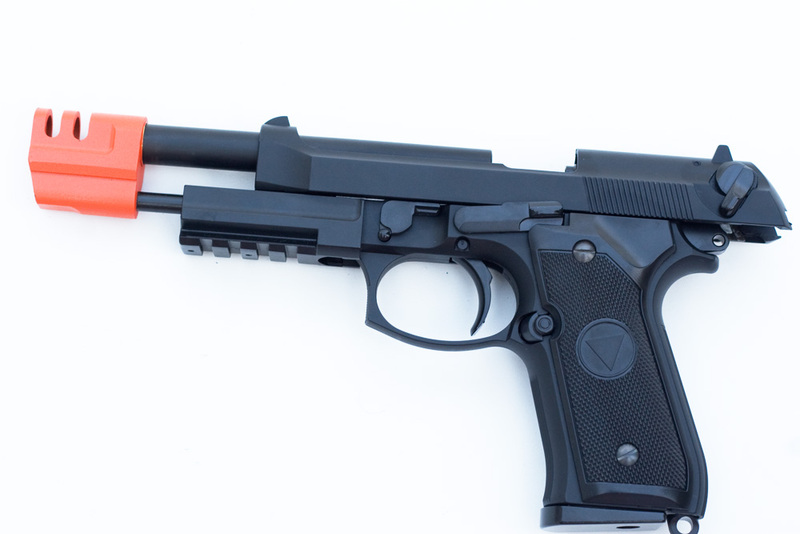 Any of the following three mags will work with the TSD M9X GBB Pistol. View of the top. You can see the feed lips for feeding BBs into the gun, as well as the rectangular gas port/air seal that releases gas from the mag into the gas nozzle of the gun. Here's the back of the magazine. The brass circle you see is the gas valve, which basically acts as a button for the valve knocker to strike when the trigger is pulled. 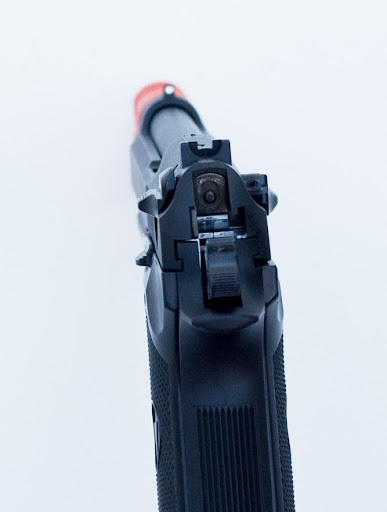 When the valve knocker strikes this valve, gas is released from the mag into the gun and propels the BB toward its target. This piece can be removed by unscrewing it, using a special tool, and then modified or replaced to increase the amount of gas released into the gun. This will give you a bit of an FPS boost, as I tested out in an earlier blog entry. This is the gas fill valve. Sorry for the blurry pic. Nobody's perfect. If you couldn't deduce it from the name of the valve, this is where you fill the magazine with green gas/propane. This also is removable in the event it starts to leak and needs repair/maintenance. Below, I suppose, would be the front of the mag. 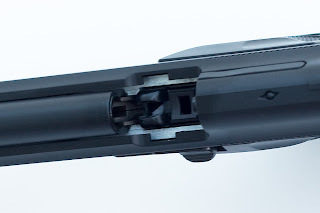 You can see the loading spring that pushes the BBs into the gun. 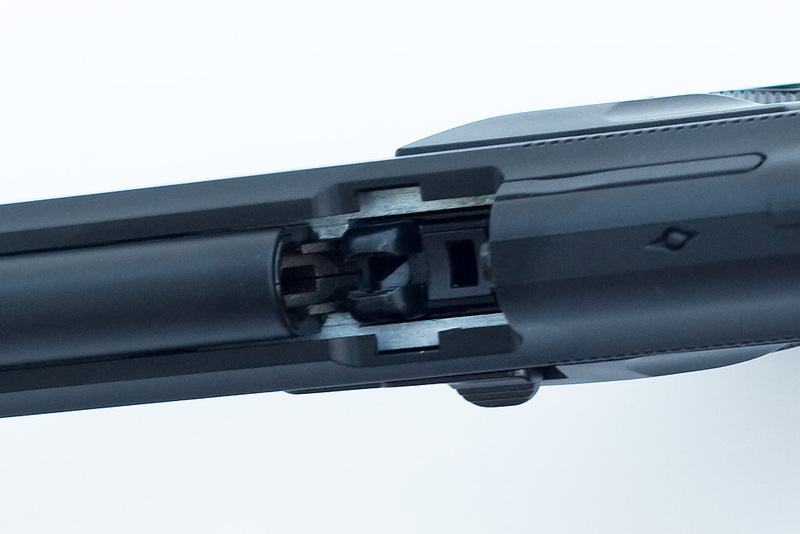 BBs are loaded into the mag at the top, where you see the two feed lips. Would you like to know how to remove the slide and recoil spring guide? No? Well I'm going to tell you anyway. First, you'll need the actual M9X. Do ya see the small lever that looks similar to the state of Oklahoma? It's directly to the right of the rail piece. That lever needs to be rotated down, 90 degrees. See the difference? No? Remove your head from it's currently dark and unpleasant place and look again. Notice the slide has been released, and has slid forward a bit. Continuing to remove the slide. See how that works? Good. I knew you'd catch on. 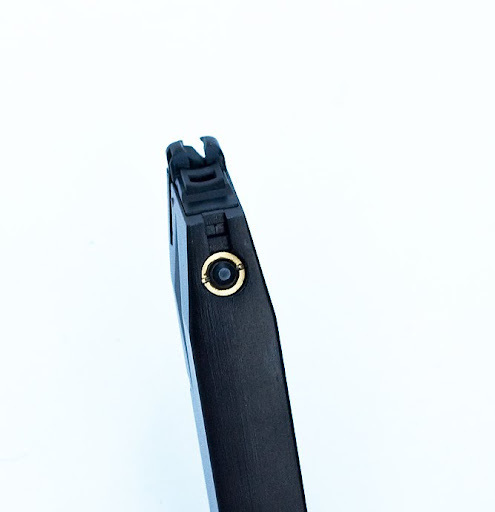 Up on the left, you've got the recoil spring and spring guide, while up and to the right, you can see the rectangular port of the loading muzzle where the gas from the magazine enters the gun. I realized my failure as soon as I took this next photo. 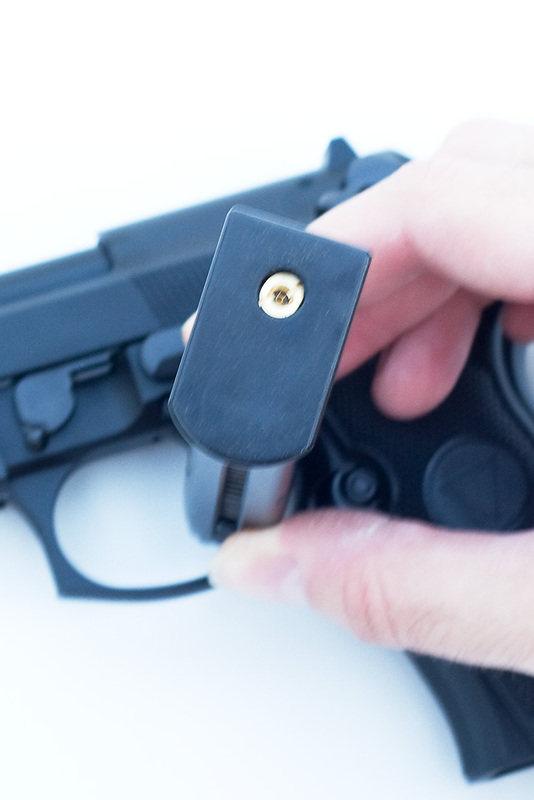 You have to unscrew the compensator before you take the recoil spring and guide out. It unscrews from the front of the compensator. You should probably remove the slide first, then unscrew the compensator in the event you forget to remove the magazine from the gun and accidentally discharge into your face or something. Don't be an idiot. That's my job. 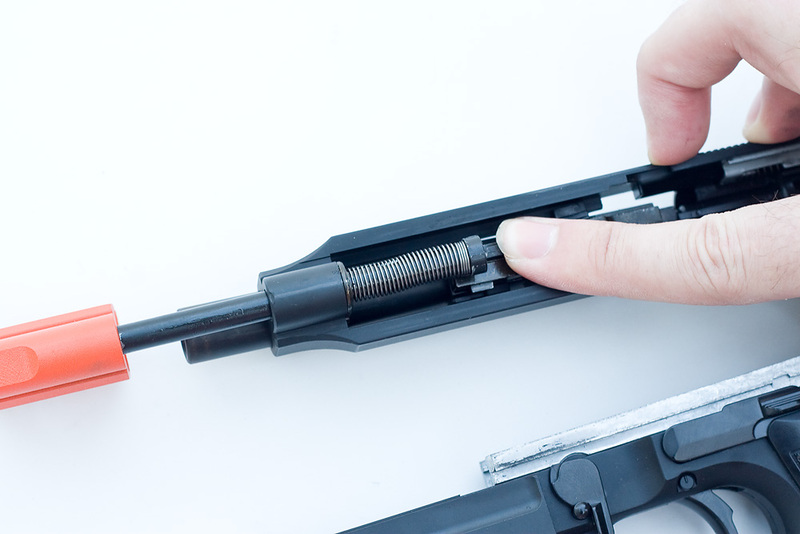 NOW, push the recoil rod out and then you can remove it, along with the spring. From there, whether you want to get to the hop up rubber to seal it up with Teflon tape or replace the o-ring on the piston, it's just a matter of removing any screws you see (there aren't that many) until you get to the prize. Not rocket surgery. And in case you didn't bother to watch the video in my gas valve mod entry, here is a brief velocity test using the unmodified, stock valves. In case you couldn't see the chrono numbers because of my poor and noobish cinematography, here's a recap. Not very many shots, I know, but you can get an idea what we're working with here. I would certainly recommend this gun to anyone looking for a solid sidearm. Consistent, lightweight, and the hop-up is adjustable. The cycle time is quick and blowback is crisp. 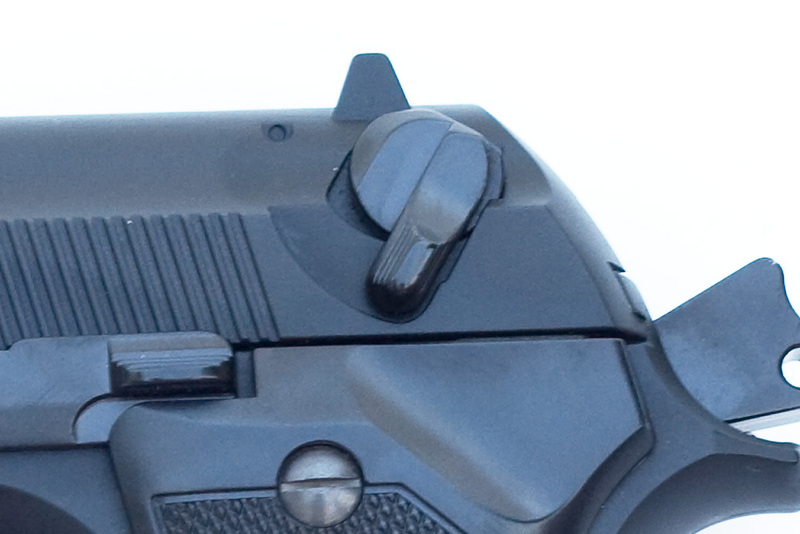 The down side would be that the rail prevents the gun from fitting into molded holsters like the Blackhawk Serpa. HOWEVER, there's an upside to that downside. The rail is removable. 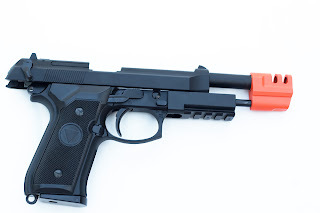 Once the rail is removed, the gun fits fine. FYI. Another upside is the cross-brand magazine compatibility. To be honest with you, I have no preference on magazines. I have both brands and they both work great. No leaks. Pretty consistent chrono readings, as you saw. Thus, I have no complaints. 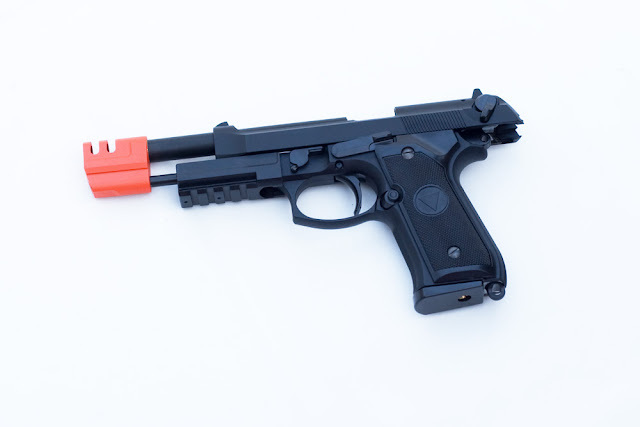 In fact, I'm quite happy with the the TSD M9X Tac as a whole. Oh yea, one more thing. It's a pretty economical option for those on a budget. I'd say that the cost/benefit ratio is "favorous" (I just made that up) to the buyer. Pyramyd Air has it listed for $67.50, which I think is very reasonable for this piece.